Tarragon Theatre presents (and stuggles with) a play adapted from a French novel about a drowned body and a married couple. In director Richard Rose’s production, Pierre (Blair Williams) and Simone (Maria del Mar) begin the play sitting at a table across from one another talking (well, she talks at him), while on vacation in Ireland. When Pierre escapes to get some fresh air along the beach, he wanders toward the back of the stage, and the lights slowly reveal the seaweed-covered body of a young woman—later discovered to be Mary, a nurse and single mother who recently returned to her hometown after a short stint in New York City. Pierre is fascinated, Simone is envious of his misplaced fascination, and the two invent the story of Mary’s life, seemingly in order to work out their own marital issues. It’s quickly clear why the couple isn’t working out. Williams’s Pierre comes off as self-centred and condescending, and del Mar’s Simone is needy and melodramatic. Their open relationship and boarding house for free-spirited intellectuals and radicals both came to an end when the first of their two daughters arrived. He’s more than a little resentful, and she’s baffled that he doesn’t share her concern for their family (and though she doesn’t make her argument in the best way, she does have a point). In the end, both are so unlikeable, it’s difficult to feel much sympathy for them. The play’s saving grace is the character of Mary herself, played with a thick Irish accent by Shaw Festival favourite Nicole Underhay. Soon after Simone and Pierre begin obsessing over her origins, Mary comes to life, at first rolling on the sandy centre of Karyn McCallum’s set, then standing and swaying like seaweed caught in a slow current. Mary, both empowered by those thinking of her and apparently displeased by their assumptions, teases them and goads them on—eventually taking on the telling of her own story. The two women find common ground in the sometimes unhappy life of a mother, but Simone and Pierre’s continuous moans about their dissatisfaction with life become all the more hollow as, standing directly behind them, we see a truly tragic victim—a young woman forced to give up her dreams of living in New York and becoming a doctor because an illicit affair left her with a child, and ultimately (and mysteriously to the audience), drowned in the sea. Unfortunately, the connections between the two stories are left foggy, which could be the result of the script having gone through a few rounds of telephone: this production uses Linda Gaboriau’s English translation of Evelyne de la Chenelière’s French-language work, which was itself based on a 1978 novel by Marie Cardinal. The performances of Williams and del Mar don’t exactly help either. Though rather one-note, Williams is at least believable as the insensitive Pierre. Maria del Mar is, unfortunately, weightless in her role. 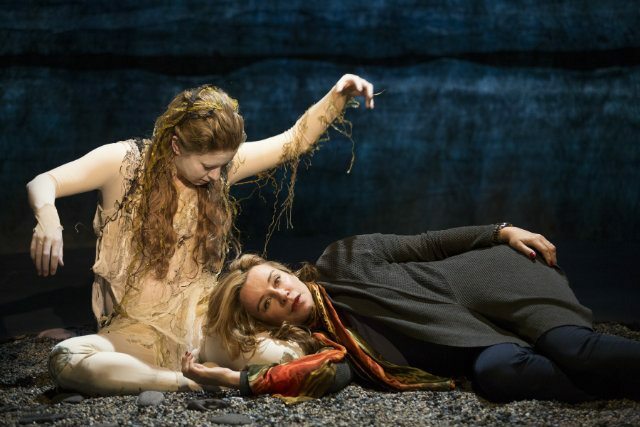 The messages in this play could be very strong, but the waters in this production of Flesh and Other Fragments of Love are a little too murky.